Aethiopia Inferior vel Exterior Monomotapa - Merian, M.
Title : Aethiopia Inferior vel Exterior Monomotapa. Size : 11.5 x 15.0 inches. / 29.2 x 38.0 cm. 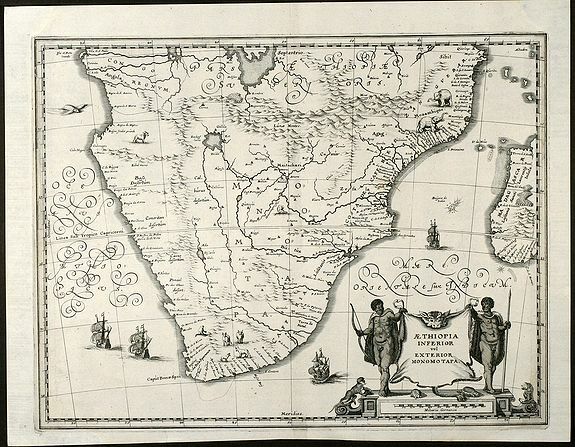 Description :Nice engraved map of South Africa from M. Merian based on the Blaeu map. With a beautiful cartouche with turtles and monkeys. With several ships and animals. Condition : Completely backed with Japan paper, professional restoration in margins. Overall in fine condition.